The real photos is always more attractive than those E photos. Will it be vulgar?. This is love. Will them like it?. 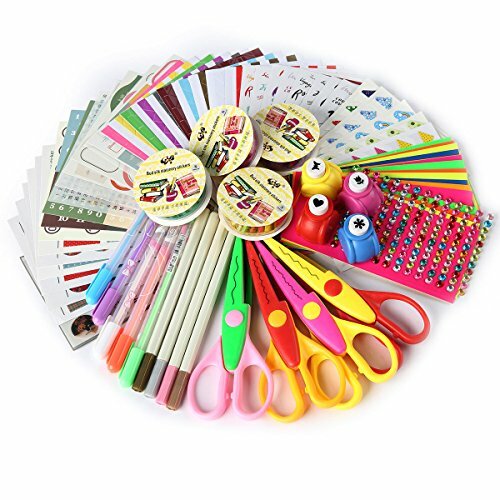 4 edge wave scissors 4 Embossing kit 4 Lace tapes 20 sheet small color cards. 9 color pens(Gold,Silver,Blue,Purple,White,Orange,Pink,Green,Brown). - Please keep away these items from 0-3 years old children for safety. - Perfect to work with SiCoHome Scrapbook,crafting and handmade project and card making. - Package Include:4 paper decorative scissors,4 mini paper punches,4 Lace decorative sticky tapes,20 sheet small color cards,9 color pens(Gold,Silver,Blue,Purple,White,Orange,Pink,Green,Brown),10 sheets corner stickers,5 sheet cute sticker,6 sheets Decor vintage stickers,1 sheet Travel story sticker,6 sheets word stickers,6 sheet Iconic Labeling stickers,4 sheet Letter sticker,2 sheet Number stickers,1 sheet month sticker. - GREAT FOR:anniversary gifts,personalized gifts,valentines day,mothers day gifts,gifts for dad,baby shower gifts,birthday gifts,wedding guest book,Photo Storage,Travel Record. - Notice: All colors and style of these accessories comes in RANDOM.